Protect Our Planet Ready for a Spring Garden? PSYCHOLOGICAL SERVICES PAT BARSCH, Ph.D.
in their hands. Several Silver City schools have active gardens including Sixth Street and Jose Barrios elementaries and San Lorenzo Elementary in the Mimbres Valley. Aldo Leopold Charter School is working on grants for the middle school and the high school to start raised-bed gardens. 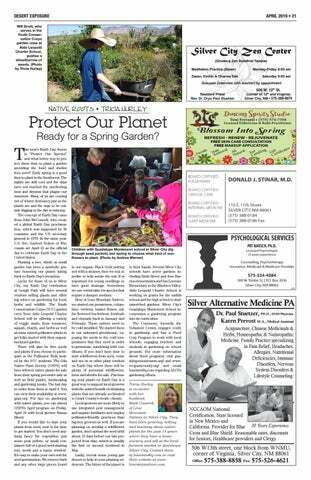 Silver City’s Guadalupe Montessori School incorporates a gardening program into its curriculum. The Commons, formerly the Volunteer Center, engages youth in gardening and has a Food Corp Program to work with local schools, engaging teachers and students in gardening on school grounds. For more information about these programs, visit guadalupemontessori.org/ and www. tvcgrantcounty.org/ and email lonemtn@q.com regarding ALCS’s gardening efforts. Tricia Hurley is co-owner with her husband, Mark Cantrell, of Lone Mountain Natives in Silver City. They have been growing, selling and learning about native plants for the past 13 years where they have a home nursery and sell at the local farmers market in downtown Silver City. Contact them at lonemtn@q.com or visit their website at www. lonemtnnatives.com. Silver Alternative Medicine PA Dr. Paul Stuetzer, PH.D., DOM Physician Karen Prevost M.A., Medical Assistant Acupuncture, Chinese Medicinals & Herbs, Homeopathic & Naturopathic Medicine. Family Practice specializing in Pain Relief, Headaches, Allergies, Nutritional Deficiencies, Immune Disorders, Nervous System Disorders & Lifestyle Counseling. NCCAOM National Certification, State licensed in New Mexico and California. Provider for Blue 30 Years Experience. Cross and Blue Shield. Reasonable rates, discounts for Seniors, Healthcare providers and Clergy.